The modern millenia's Mona Lisa -- that unforgettable portrait photograph of the Afghan Girl, which was snapped in 1984 and published by National Geographic on the cover of its June 1985 issue -- is in town. That iconic photograph along with 75 others, all taken by lensman Steve McCurry during his travels around the Middle- as well as varrious other parts of South Asia are currently being exhibited at the Islamic Arts Museum Malaysia under the title: A Common Faith: Steve McCurry's Travels through the Muslim World. The thematic string that runs through every photo at the exhibition gives it great relevance for the Islamic Arts Museum where the photos are being exhibited in the capital. A bonus for visitors is the fact that almost every photo is a must-see masterwork at the exhibition. From afar, some look like exotic Renaissance oil paintings while others are simply visually stunning. What visitors at the exhibition will immediately note is that, through his work, McCurry gives a face to the troubles and joys in the lives of people in the Muslim world. However, since there are always people new to the iconic Afghan Girl portrait let us tell the short story that lies behind the image. In the beginning, the mysterious Afghan Girl, of course, was just a nameless girl in a refugee camp in Pakistan, displaced from her homeland after her whole family was almost annihilated by the Soviets who invaded Afghanistan. As part of his National Geographic assignment, McCurry had to disguise himself as an Afghan and was snuck into the refugee camp by aides hired by National Geographic. At great risk to his life (in a paternalistic society such as the Afghans' and Pakistanis', it is unthinkable for a man to take photos of their women folk, especially one who is neither a family member nor a Muslim), he managed to sew the film rolls into his garb and snuck out of the place. 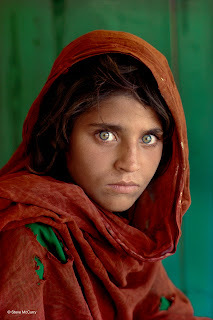 Then, the photo of the Afghan Girl was selected for NatGeo's cover story titled Along Afghanistan's War-torn Frontier. The article does not identify her specifically -- she was simply a face of the Afghans' plight following the onslaught of the Soviet invasion of her homeland -- but the article did deal with the lives and losses of the people as a result of that deadly conflict. National Geographic, of course, got added mileage from her, when the magazine engaged McCurry to track down the mysterious girl 17 years later and she turned out to be a woman called Sharbat Gula. Good things did come out of the photo shoot that followed this National Geographic in-search-of documentary: "The documentary we made after finding her again had a big impact on my life. The best part of the story was being able to help make her life better. There was a school built in Kabul based on the donations collected from that picture," McCurry says. 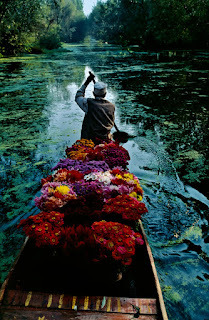 Another stunning photograph (among many others, I might add) that visitors to the Islamic Arts Museum's exhibition will feast their eyes on is Flower Seller in Lake Dal in Srinagar, Kashmir (1996). Despite the war and pain, McCurry explained, he was moved by the ability of these strong people to continue going about their daily lives and appreciating the beauty in all things around them -- and in the case of the Flower Seller, the beauty of flowers. "A Common Faith: Steve McCurry's Travels through the Muslim World" exhibition is currently ongoing at the Islamic Arts Museum Malaysia until April 8. It is reported to be McCurry's biggest exhibition. Entrance fee is RM12 for adults. Call 03-22705160; 22705158; 22705164; 22705117; 22705142; 22705135 or 22705110 for details. You can also email info@iamm.org.my. two words to say! "like it" the photo is quite beautiful with combination of human and nature. The modern millenia's Mona Lisa who was just a nameless girl in a refugee camp in Pakistan, displaced from her homeland after her whole family was almost annihilated by the Soviets who invaded Afghanistan. since there are always people new to the iconic Afghan Girl portrait let us tell the short story that lies behind the image and deal with the lives and losses of the people as a result of that deadly conflict. This make me feel poor. It is very surprising to see that there are people with a common faith, seeing that even if people follow the same religion, faith is mostly individual. I love the image, it makes art look more real and beautiful. Analyzing data isn't always an easy thing to do, however with the assistance of a professional expert, there is always the chance to do a good and relevant assignment. With us, the best Assistance with Analyzing Statistical Data Quantitatively is guaranteed.